Boggler Blogger: Jhangri Preview: The 5 Faces of Jhangri! Jhangri Preview: The 5 Faces of Jhangri! 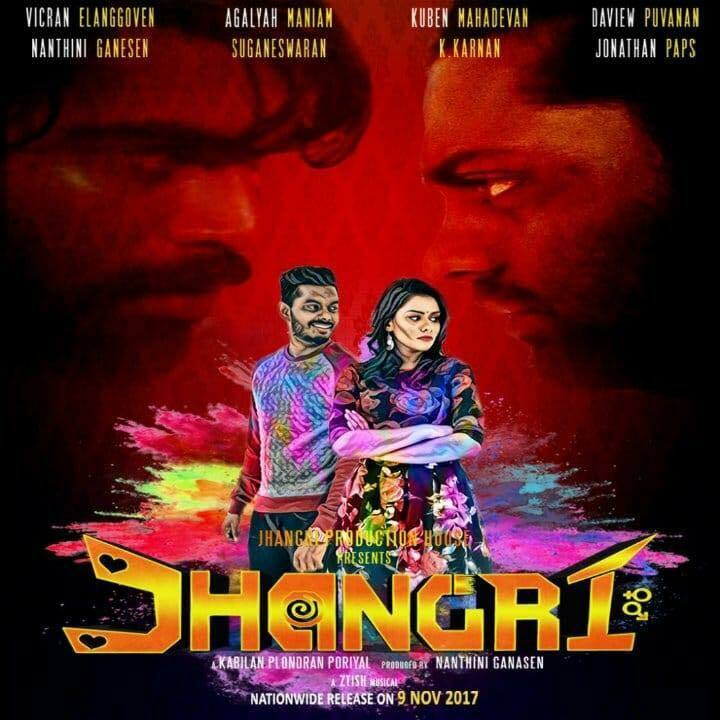 Directed by Kabilan Plondran and produced by Nanthini Ganesan, Jhangri is a very sweet film that is set to hit cinemas near you from 9th November 2017 onwards. When it comes to Malaysian Tamil Films, it is usually very hard to get people to watch the film in cinema. Well who can blame them, judging on some of the quality of past film except a handful few which is amazing. With the film set to hit the cinemas very soon, here is Boggler Blogger’s introduction of the 5 faces of Jhangri. Vicran Elanggoven, the boy that hails from the mighty town of Klang. I felt so much of pride just writing that one line. To see one of our very own Klang homeboy being hero in full feature film. Vicran apart from being an actor, Vicran is also a very talented rapper, lyricist & host. He is part of a team called Outlaw Malaysia who had just recently released an album called Gethu. Do check this album out as it is a chartbuster. The journey for Vicran started back in 2010 where he released a single track called “Naage Jothi” together with Viveck JI of Chakra Sonic. From there Vicran kept his head down and work hard and finally got his big break through in Geethaiyin Raadhai. In this film, Vicran played the role of Jeeva who was the hero’s best friend and without a doubt he was the one making us laugh in the film with his style of dialogue delivery. Vicran’s potential of acting can be seen from this film itself. Today in Jhangri, Vicran plays the lead role in the film which happens to be named Vicran as well. I was told that there were people who mocked him and laughed at him when he said he was going to be playing the lead role in Jhangri. Despite all those criticism, Vicran went on to take up the role and I am very glad he did so. The role fitted Vicran like a "T". If you loved Vicran in Geethaiyin Raadhai, you will become a fan of him after Jhangri. This is all the more reasons why YOU should watch this film in cinemas near you. 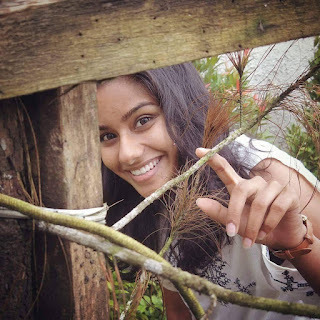 Agalyah Maniam is a young and talented actress who is looking set to dominate the local film. She is primarily well known for her portrayal as Kalyani in a short-feature film called “Venpa”. Following the success of Venpa, she landed a role as a host in Astro’s live programme called Vizhuthugal. Apart from this what many people don’t know that well is that Agalyah is a degree holder in Bsc Accounting & Finance whereby she graduated in March 2017 from Sunway University. Apart from acting, Agalyah is a Certified Yoga Instructor having graduated from Sakthi School of Yoga back in March 2017 and is now actively running both open and private yoga classes in KL, Puchong, Klang & Shah Alam. In Jhangri, Agalyah plays the role of Janusree, whereby she is the lead heroine of the film. She spots a character who seems to be working in a corporate background. Having been a super jovial character in real life, Agalyah plays a very serious and driven character where her events from the past is affecting her life and career today. To understand the complexity around the character of Janusree, you will need to watch the film to find out. 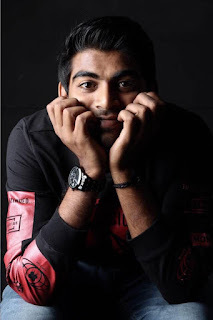 Puvanan Manokaran or better known to his fans as DaView Puvanan is a Youtuber who is well known for his film reviews through his channel called “DaView”. Despite being a graduate in Actuarial Science, Puvanan has started to venture into acting through Jhangri. It all started with Puvanan attempting hosting for a couple university events & functions. Growing from that confidence, Puvanan pushed the boundaries within him and together with his friend called Mohandass, they started a YouTube page called “DaView”. Their first film review on YouTube was for Thalapathy Vijay’s film Theri. From there DaView grew with more film reviews and thanks to a few controversial videos, it made DaView and Puvanan a household name among fans who seeks for unbiased film reviews. He credits the DaView as the reason why he was casted in Jhangri and has now played the character of Ravyn. The character he plays is a supporting role to the film hero. Instead of expecting just a substandard supporting role, you will get a comical rollercoaster from DaView Puvanan’s performance. He will make you laugh throughout the film and make your experience watching Jhangri a very sweet one indeed. Holla to another Klang boy who is making it big. Karnan G Crak is one of the big name cast in this film. Karnan’s journey in films started back in 2009 when he was part of a short film called Kick Start. Through his convincing performance as X in Kick Start, Karnan won the Best Actor Award and the People’s Choice Award in the BMW Shorties in 2010. He followed that up by winning the 2014 Best Actor Award in the Malaysian Kalai Ulagam Awards. From here Karnan’s career branch in two ways, one as an actor and the second as a singer. 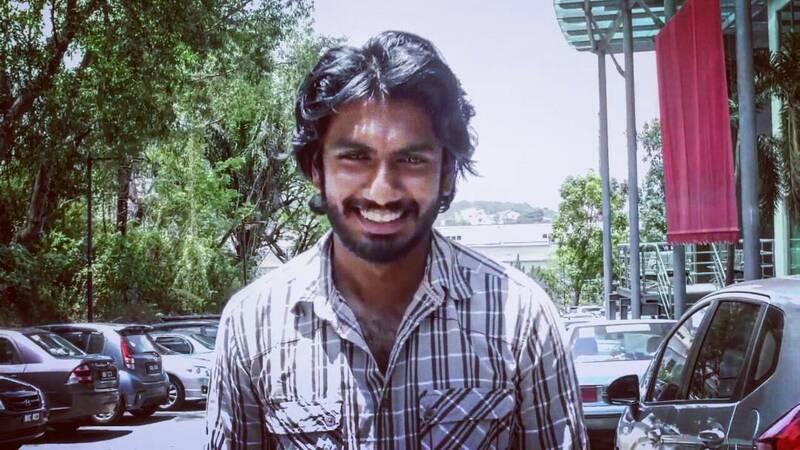 Karnan is part of Outlaw Malaysia, together with Vicran. He was also the hero in the film called Geethaiyin Raadhai, where he shared screen space with Vicran. Karnan was also casted in Jagat and made a brief cameo in En Vittu Thothatil. Now you know why I said Karnan is one of the biggest cast in this film. Despite that stardom, Karnan has played a minimal but impactful role in this film. This is the first time he has shared screen space with Kuben Mahadevan despite having work together in Jagat and those scenes is one to look for. Karnan’s character in the film carries a little dark shade and it is refreshing to see him play different roles. The quote “Siricha Thangam Mathri, Morecha Singam Mathri” is absolutely apt for this guy over here. Having had the opportunity to be around him a few, I would say he is one of the funniest person you will come across yet on screen he can switch himself up to play a serious villainous role easily. Despite that Baby Koba claims that he has a serious face and a silent type of guy. Baby Koba was introduced into the acting world in a short film called Naan Thirudan back in 2013. 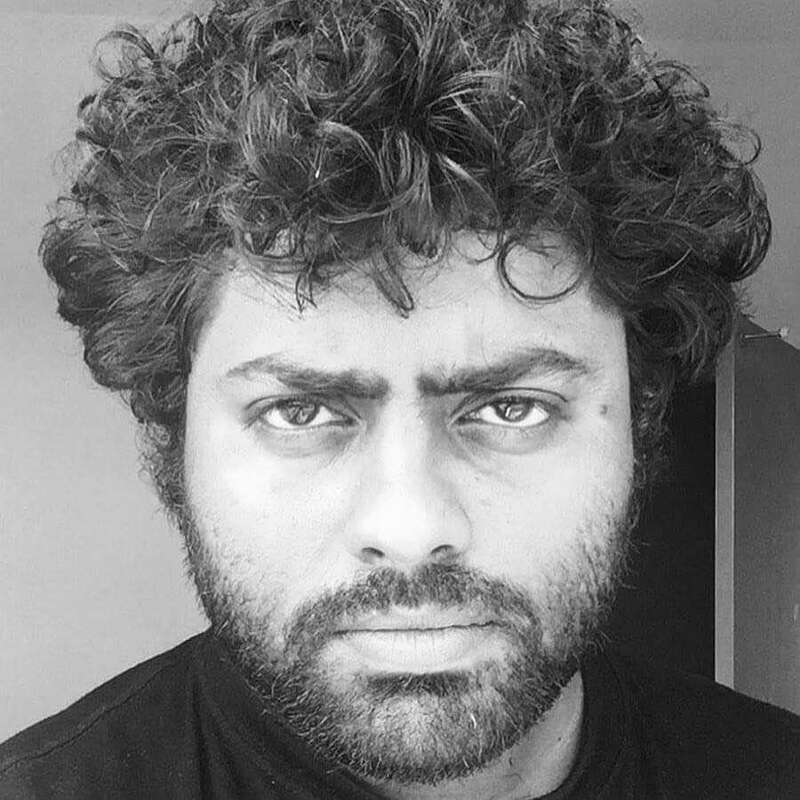 His debut feature film was under the helms of Karthik Shamalan through Mella Tiranthathu Kathavu, also back in 2013 where he pulled of the role of a villain. However, the film that established Kuben Mahadevan as a top class actor was none other than JAGAT. In Jagat, Kuben eased the role of Maniam with so much class and perfection which lead him to be nominated in the Asean International Film Festival & Awards (AIFFA). This is indeed a proud achievement for our film industry. And now Jhangri is going to be Baby Koba’s second theatrical release and if you need one reason to watch the film, that one reason for me is watching Baby Koba. Here he plays the role of Bhavan who seems to be like the villain of the film. He even has his own theme music for his character in this film. It will be very interesting to see how the serious face Kuben fits into a comical filled film. 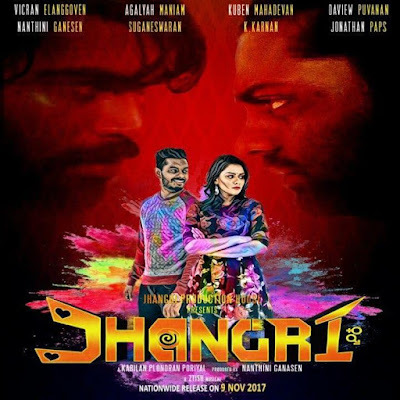 Jhangri is being released in cinemas near you from 9th November onwards and it is a film that you shouldn’t miss as it will make you laugh throughout the film and you have these 5 amazing actors who are set to impress you in this film.